Family dinners are the most important daily occasion my household put importance to, this is where we share everything about what has been the whole day for each member of the family, it’s sort of like an occasion where you munch and report to mom what happened to you the whole day – it’s actually fun and interesting listening to your kids what they’ve done the whole time over dinner. While we always look forward to this ritual everyday, I also make sure as a mom to prepare something great, just simple and nutritious food over dinner table to share with. I’m also very particular in having tasks delegated, this will ensure everybody’s participation on the preparation of the dinner, juice making is normally assigned to my eldest son, Lean, we’ve been Kool-Aid drinkers for sometime now, besides having all the required nutrients, it’s actually very simple and easy to prepare – it does not require much from the kids to help prepare things for dinner. Right now, we’re crazy with cherry flavored one; the kids were actually the ones picking those packets at the grocery shelf. 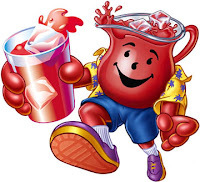 Kool-Aid actually has lots to offer, besides their cool juice canisters, jammers, packets, they’re also proud partner of KaBoom to helping build playgrounds for less fortunate kids. Want more? Here’s the coolest part, like Kool Aid Noches de PeliKoola at Facebook and download your coupon for your next Kool Aid buy, or simply click some downloadable movie-related bingo cards to play during the movie – your entire family will surely have a blast on this. Don’t just trash those cards away, they can be your next recipe card – check out the back portion for yummy Kool Aid recipe. So there, sharing my family’s love affair with Kool-Aid, what’s yours? Share it with me. Kool aid was known flavorful and fun coz of the red stains it creates!